Japanese Food Recipes by Kumiko Yamadera. I will introduce a popular home-cooked dish in Japan. It’s “nikujaga”, created by Katsuyo Kobayashi (1937 – 2014), one of Japan’s most famous cookery researchers. 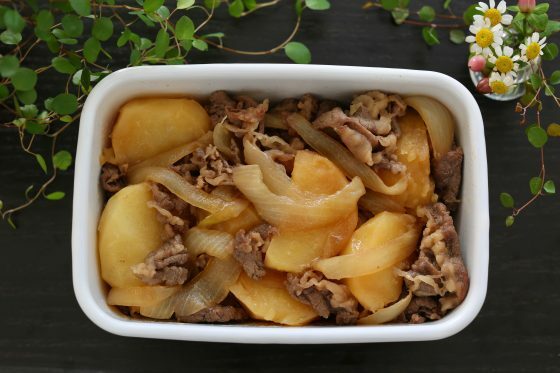 “Nikujaga” means stewed beef (niku) and potatoes (jaga-imo). This nikujaga is the most popular recipe among Kobayashi’s dishes, said to total more than 10,000. 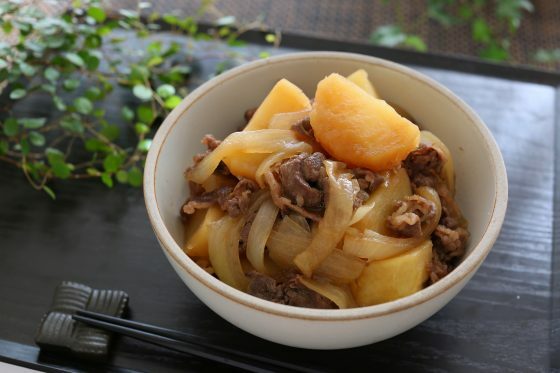 By simply simmering for just 10 minutes, you can make deliciously tasty nikujaga. This is Katsuyo Kobayashi’s recipe for “nikujaga”. All the steps of the recipe will be explained later based on photos. Peel the potatoes and cut them into quarters. Cut the onion in half vertically, then cut into 1cm wide strips. 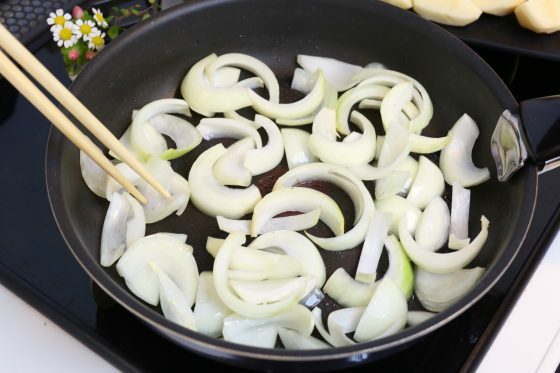 Heat the salad oil in a frying pan, and fry the onion over a medium heat until it gets hot. Open a space in the middle of the pan and add the beef. Sprinkle the sugar, mirin, and soy sauce on the beef, and mix in the seasoning while untangling the beef. 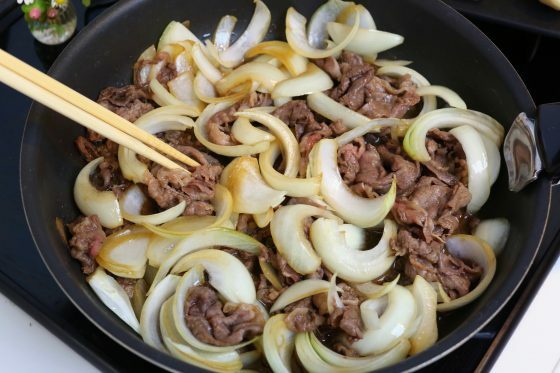 Stir-fry the beef and onion. Add potatoes and water, cover with a lid, cook for 10 minutes at medium heat, and you’re done. I will explain the recipe based on photos. First, cut up the vegetables. Peel the potatoes and divide each one into four equal parts. Then cut the onion in half and cut it further into 1cm wide strips. Next, add vegetable oil to a heated frying pan and fry the onion on a medium heat. Once the onion is lightly fried, it’s okay. Nikujaga is usually made in a pot, but this version is cooked in a frying pan. By using a frying pan, which has a relatively wide bottom compared to a pot, the ingredients do not pile on top of each other, so that the heat passes through everything evenly and the flavor is easily absorbed. The taste becomes easy to stain. Another benefit is that the potatoes are less likely to fall apart when boiled. 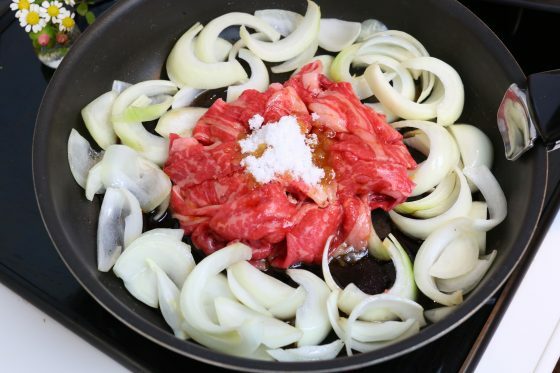 When the onion is good and hot, open up a space in the middle of the pan and place the beef in the center. Then add the sugar, mirin, and soy sauce to the beef. Continue to untangle the beef and mix the seasoning into it. 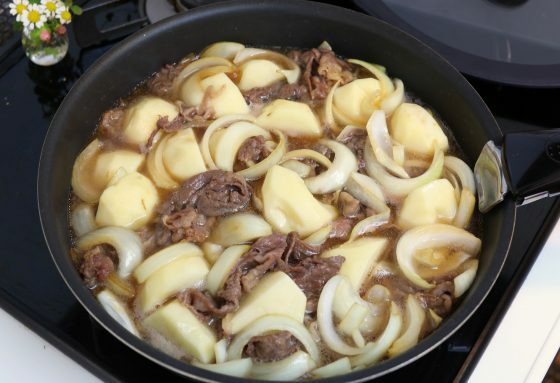 Once the beef is sufficiently flavored, mix it with the onion. 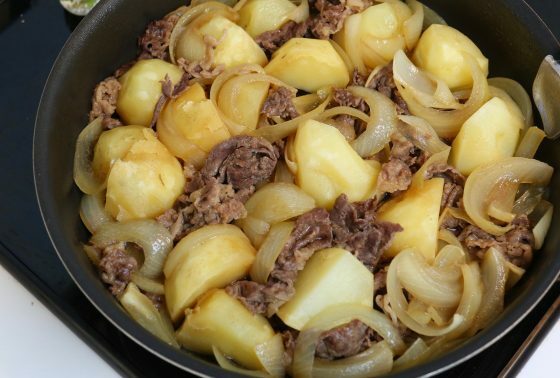 When the beef is browned, add the potatoes and water, cook for 10 minutes on a medium heat. 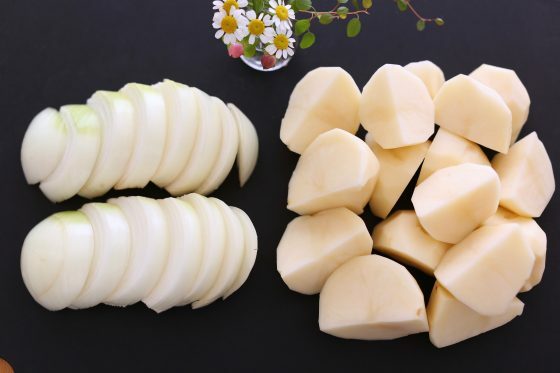 Nikujaga is usually boiled with a Japanese style stock, but this version uses water instead of soup stock and takes advantage of the potato’s natural sweetness. It’s finished once the juice has reduced considerably, and the whole dish is slightly the color of soy sauce. Serve in a dish and you’re done! 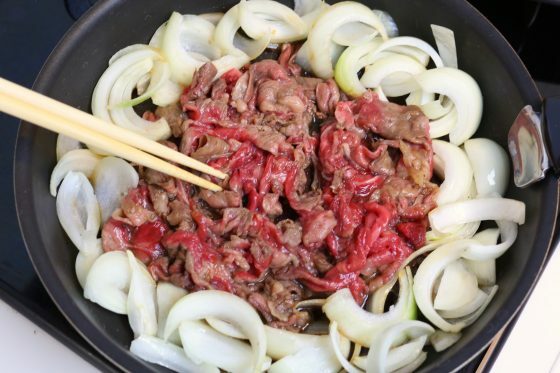 The seasoning has a moderate sweetness like sukiyaki, which goes perfectly with beef. And the natural sweetness and hot fluffy texture of the potatoes really stand out. Using this simple approach, you can make nikujaga with a reassuring flavor that you’ll never get tired of. A simple sushi rice recipe. How to make sushi vinegar and vinegared rice. An easy omurice recipe. Three minutes in the microwave. Here I shall introduce you to some Japanese ingredients. Copyright© kumiko-jp.com, 2019 All Rights Reserved.